We're following that post with a series of short profiles that will collectively provide a starting point for an exploration of international blogs, online magazines, and pages. We began by looking at Kilele, We Take Pictures Too, Arab Image Foundation, Greater Middle East Photo, Space Cadet, Street Level Japan, Kantor Berita MES 56, Japan Exposures, Invisible Photographer Asia, and my new notebook. Today we explore Romania's oitzarisme. 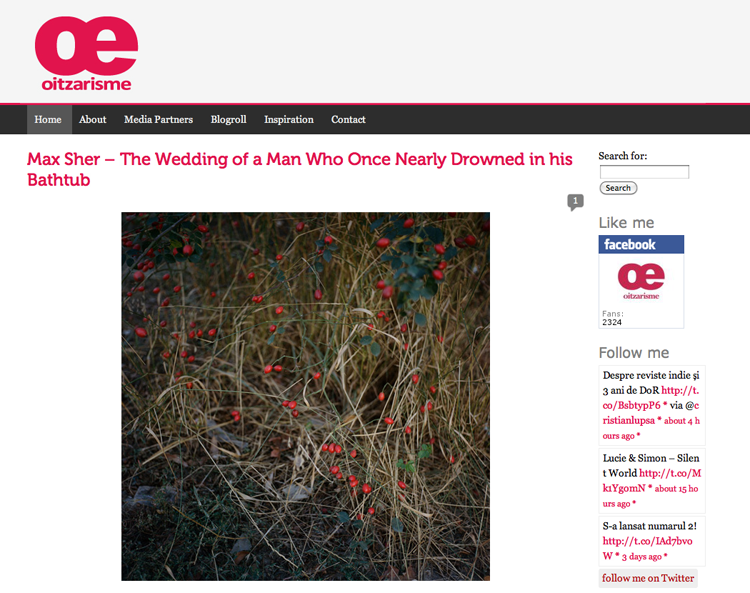 In a sentence: A web-gallery featuring a wide-range of photographic styles. Nimigean presents a photographer's portfolio, statement, and short biography with no further commentary, about one a day. The curation ranges across the contemporary photography map, from street to documentary to conceptual, perhaps with a slight emphasis towards the latter. The only true common denominator is the strength of what he presents. He does a good job of presenting work from photographers not frequently seen on other sites. oitzarisme is a made-up word that Nimigean says means something like "sheep things;" it was one of LPV Magazine's Top 15 Photography Websites of 2011. In January 2011, Nimigean started a second project, a bimonthly online magazine called Love Issue. oitzarisme has an open submission policy; it can be found on Facebook and followed on Twitter.